Choi + Shine’s installation for the I Light Marina Bay Festival added a poetic touch to the Singapore skyline using a traditional manual technique, crocheting, to create macro light objects inspired by the natural shape of the sea urchin. The Studio Azzurro Room is a Renaissance hall in the Vatican Museum renamed recently in honour of Studio Azzurro’s interactive video installation In Principio (e poi). The famous artists’ collective used MaxFine porcelain slabs by FMG Fabbrica Marmi e Graniti in the installation, making them part of a work of art in one of the most symbolic sites of world culture. 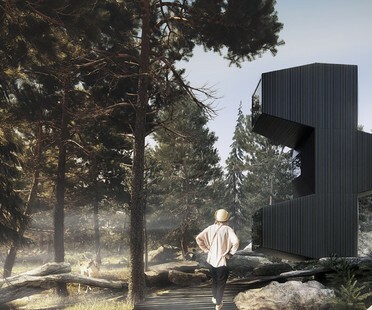 Living Unit is a temporary home developed by a research team including architects from four studios, OFIS, C+C, C28 and AKT, on display during Milano Design Week at Parco Sempione in Milan. 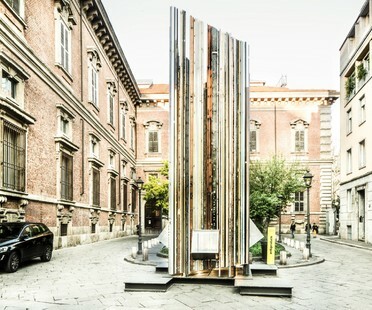 A new point of view, an invitation to discover the sky over Milan through an installation of metal and light designed by studio Gambardellarchitetti for Milano Design Week 2017. We read H2O’s message in a bottle and tell you about the event held during Milano Design Week 2017 in H2Otto’s spaces by the agency Estesa 2.8. 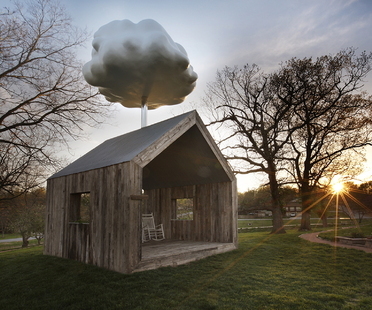 The Cloud House by American artist Matthew Mazzotta combines art and technology in the rather surreal backdrop of a small, gabled A-frame shelter with a cloud sitting above the roof that rains when you sit on one of the white rocking chairs inside. The symbol of the SALT festival are the old wooden racks used to dry fish in the Arctic.